PRODUCT: 3/8" ID X 50' RED AIR HOSE (AIRHOSE), 250 PSI, PLIOVIC WITH 1/4" MALE NPT BRASS FITTINGS. COST/HOSE. 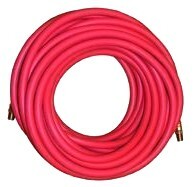 DESCRIPTION: 3/8" ID x 50' Red Air Hose (airhose) with 1/4" male NPT brass fittings. 250 PSI. Made in the USA from Goodyear Priolic Plus material. Unlike rubber Goodyear Piovic material will not absorb grease and oil and remains flexible in nearly all temperatures. APPLICATIONS: A lightweight, economical general purpose hose for carrying air, water and many spray solutions. Most commonly used on air lines, in-plant pneumatic tools and stapler guns, lawn and garden hand sprayers, light duty air compressors, various OEM equipment. Tube: Black Pliovic® synthetic RMA Class B (Medium/High Oil Resistance) designation. Temperature: -10°F to 150°F (-23°C to 65°C).